You, your company or your organization can sponsor a secure medicine drop box. It's easy and it saves lives. They're easy to use and they work. 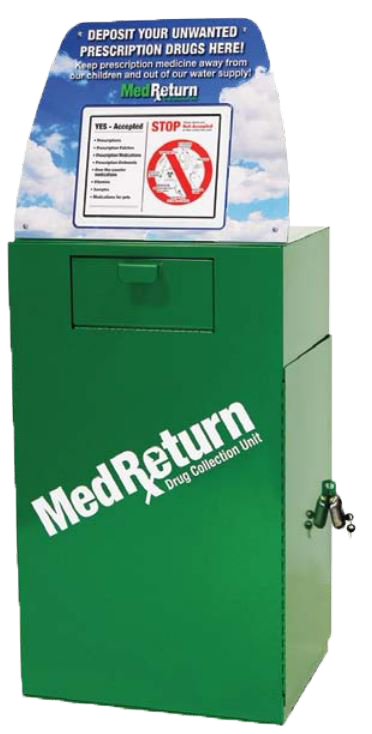 Experience across the United States shows fixed-site drop boxes are the most effective method for collecting unused medicine, especially when located in pharmacies. Currently, only seven pharmacies in the county have drop boxes. We need more! A key reason more pharmacies are not placing drop boxes in their pharmacies is cost. By adopting a drop box, your organization makes it possible for more drop boxes to be available to Milwaukee County residents. More drop boxes = more lives saved. Pricing today ranges from approximately $3,500 to $5,000 per year, depending on volume and usage. Sponsors will support all costs for a pharmacy’s drop box and be allowed to have logos on the box. Payments are made directly from sponsor to host pharmacy. We will arrange for media and social media exposure for both hosts and sponsors. We will include all sponsors on our website and all hosting pharmacies on our homepage map. To learn more, click here to send us an inquiry. Thank you for helping save lives in Milwaukee County!